Make de hoje é uma reprodução de um look que fiz em uma cliente, e que - modéstia a parte - eu amei o resultado! Fiz algumas alterações pra deixar ainda mais interessante a composição! Today's makeup is a representation of a makeup look I did on a client, and - if I may say so myself - I loved the result! I made some changes to make it even more interesting! Começo iluminando abaixo da sobrancelha com uma sombra bege opaca (Powdered Sugar), esfumo no côncavo uma sombra marrom claro opaco de transição (Gingerbread Latte), depois uma sombra marrom médio opaco (Gingerbread) e escureço o canto externo com uma sombra marrom opaca bem escura (Reindeer Paws). I begin highlighting the brow bone with a matte beige eyeshadow (Powdered Sugar), blend in the crease a light matte brown as a transition shade (Gingerbread Latte), then a medium matte brown eyeshadow (Gingerbread) and darken up the outer corner with a very dark matte brown eyeshadow (Reindeer Paws). Recorto um semi cut crease com uma base de sombras branca e bem no recorte aplico uma sombra dourada clara metálica (Spiked Eggnog). I do a semi cut crease using a white eyeshadow base and only in the edges, I apply a light-medium metallic gold (Spiked Eggnog). Na diagonal, aplico uma sombra metálica dourada (Warm & Toasty) e uma sombra rosa duochrome (Hot Toddy) blending the edges and mixing the colors. Volto com um pouco da sombra marrom opaca bem escura (Reindeer Paws) pra finalizar o esfumado. In diagonal, I apply a metallic gold eyeshadow (Warm & Toasty) and a pink duo chrome eyeshadow (Hot Toddy) blending and mixing the colors together. I come back with a little of the very dark matte brown eyeshadow (Reindeer Paws) to finish the smokey. Traço um delineado gatinho fino com delineado em gel e na borda do cut crease aplico um delineador de glitter dourado. I do a thin winged eyeliner with gel eyeliner and in the edge of the cut crease, I apply a golden glitter eyeliner. Aplico um lápis preto na linha d'água e esfumo com a sombra marrom opaca bem escura (Reindeer Paws) e com o pincel de esfumar que usei a sombra marrom médio opaco (Gingerbread), sem pegar mais sombra, dou acabamento no esfumado. Aplico primer pra olhos no canto interno e início da pálpebra inferior e aplico uma sombra verde oliva bronze metálica (Spice of Life). I apply a black pencil liner n the waterline and smudge with the very dark matte brown eyeshadow (Reindeer Paws) and with the brush I used to apply the medium matte brown eyeshadow (Gingerbread), without taking more product, I finish the smokey. I apply an eye primer in the inner corner and the beginning of the lower lid to apply a metallic bronze olive green eyeshadow (Spice of Life). Ilumino o canto interno com a sombra dourada clara metálica (Spiked Eggnog) e finalizo com bastante máscara pra cílios. I highlight the inner corner with the light-medium metallic gold (Spiked Eggnog) and finish applying some coats of mascara. Ahhhhhhhhh como ficou lindaaaa! Adorei essa make! Sou apaixonada pelas suas maquiagens, sério. 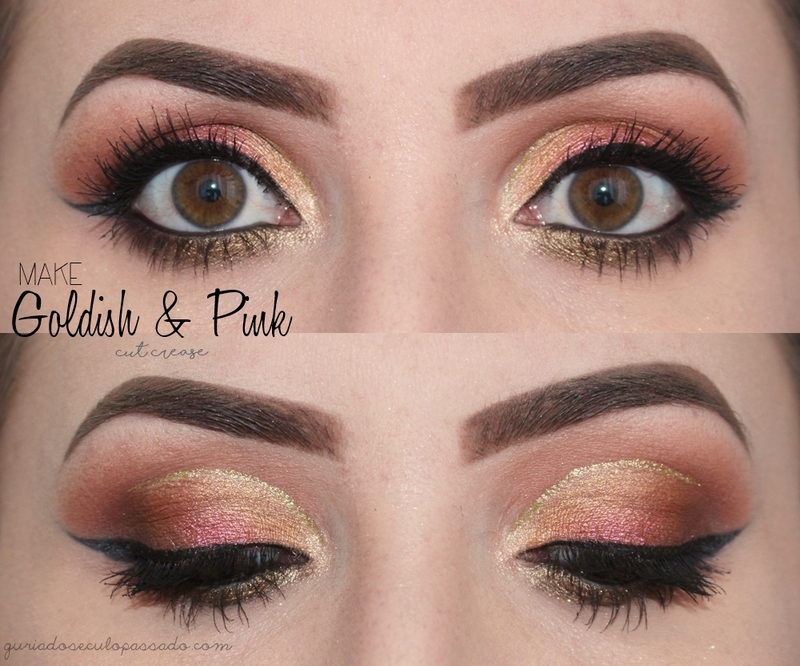 Amei esse cut crease, os tons que você usou ficaram perfeitos juntos! Menina ficou INCRÍVEL ESSA MAQUIAGEM!! Sério você mandou muito bem! Que linda que ficou, amei Lu! Que maquiagem linda *-*. Eu amei bastante os tons escolhidos, ficaram bem bonitos e diferentes. obrigada Carol! fico feliz que gostou! Amei a make!! Lindos olhos. Essa combinação de marrom, bege, branco, rosa duochrome e dourado metálico ficou simplesmente perfeita.